The following is a list of conferences where OHP related research is likely to be presented. *If you are organizing an upcoming conference with topics related to Occupational Health Psychology, please let us know about it! Contact the SOHP webmaster to have your conference listed on this page. November 6-9, 2019. Work, Stress, and Health 2018: What Does the Future Hold?, Philadelphia, PA.
September 5-8, 2018. 13th European Academy for Occupational Health Psychology Conference, Lisbon, Portugal. Deadline for submissions has passed. April 29 – May 4, 2018. International Congress on Occupational Health: ICOH 2018, Dublin, Ireland. Deadline for submissions has passed. May 8-11, 2018. 2nd Annual Symposium to Advance Total Worker Health: Work & Well-Being: How Safer, Healthier Work Can Enhance Well-Being. Bethesda, MD. Deadline for submissions has passed. November 4-8, 2017. American Public Health Association Annual Conference, Creating the Healthiest Nation: Climate Changes Health, Atlanta, GA. Deadline for submissions has passed. April 19-21, 2018. 33rd Annual Conference of the Society for Industrial and Organizational Psychology, Chicago, IL. Deadline for submissions has passed. June 7-10, 2017 – Work, Stress and Health 2017: Contemporary Challenges and Opportunities, Minneapolis, MN. April 27-29, 2017 – Society for Industrial and Organizational Psychology Annual Conference: Exploring New Frontiers, Orlando, FL. October 29-November 2, 2016 – American Public Health Association Annual Meeting and Exposition, Denver, CO.
August 4-7, 2016 – 2016 American Psychological Association Convention, Denver, CO.
July 12-14, 2016 – 2016 Occupational Health Psychology Summer Institute, Portland, OR. June 3-5, 2016 – 1st international Working Women in an Ageing Society (WWAS) Conference, Fujuoka, Japan. June 1-3, 2016 – Creating Healthy Organizations Conference: Science and Practice of Productivity and Well-Being, Irvine CA. May 29-June 1, 2016 – Fourth International Conference on Well-being at Work, Amsterdam, The Netherlands. April 14-16, 2016 – Society for Industrial and Organizational Psychology, Anaheim, CA. 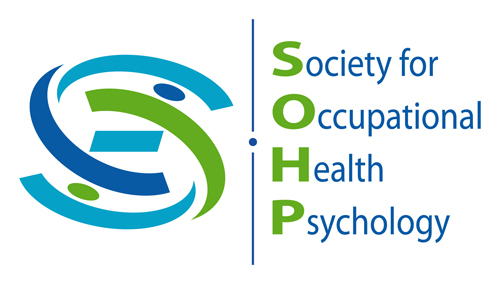 April 11-13, 2016 – 12th Conference of the European Academy of Occupational Health Psychology, Athens, Greece.